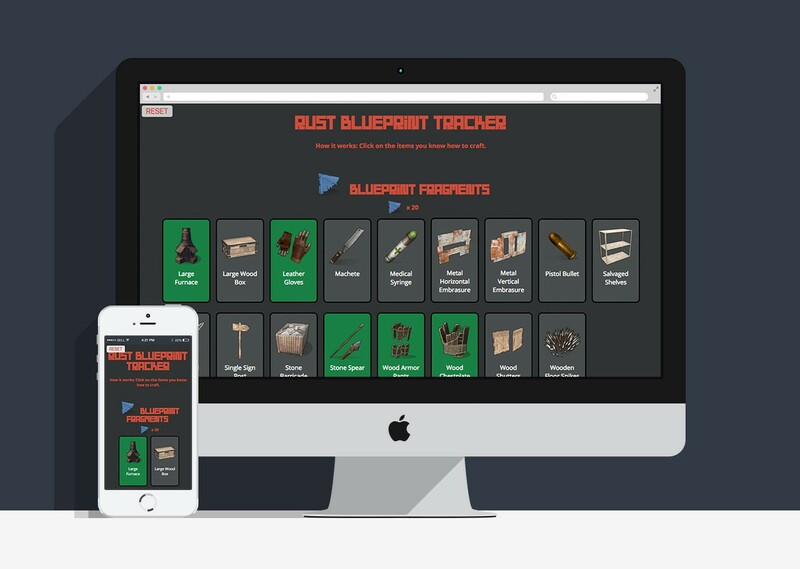 The Rust Blueprint Tracker is a tool for players of the online game Rust to keep track of their in-game item blueprints. It serves as a checklist for which blueprints the player has, and which ones they have left to collect. I worked on this project solo, getting feedback from peers and the Rust community. Part of the Image hat Inspired the Tracker. 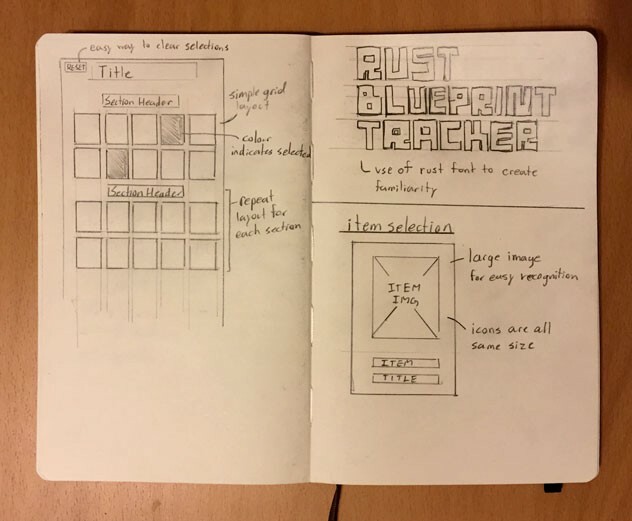 I created the Rust Blueprint Tracker after asking myself, how could I make my own experience playing the online game Rust better. One of the things I was frustrated with was having to cross reference my item crafting inventory with the Rust wiki page to remind myself of which item blueprints I had yet to discover. 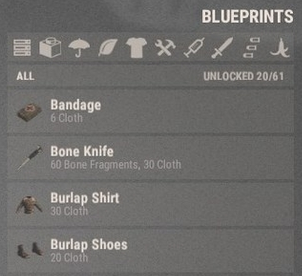 I saw an image on reddit that listed out all the item blueprints and how well received it was by the community. This inspired me to create the tool to save people time and energy. 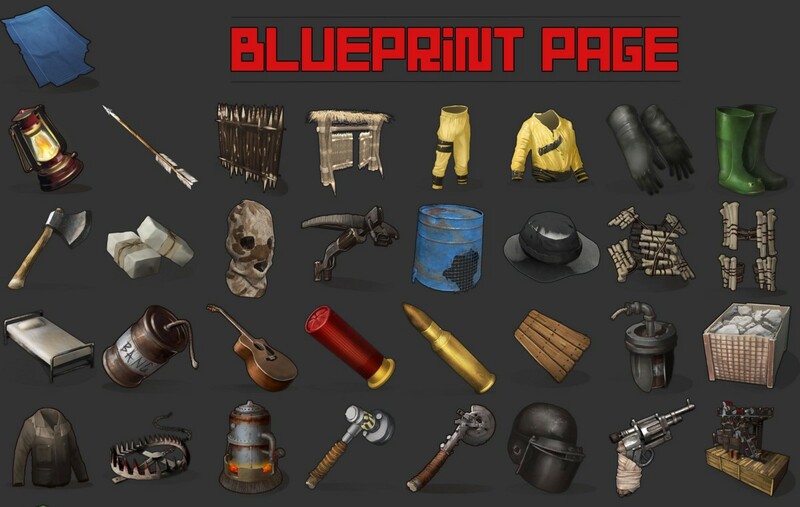 Rust can have anywhere from 20,000 to 50,000 or more daily users, so there is a significant amount of people that would benefit in having a tool that they could use to keep track of their item blueprints. To really see the potential user base for this tool, I checked the demographic of people were playing this game. I found that almost 50% of Rust active players were connecting from countries with primary languages that weren’t English. Knowing that many users may not grasp english, I chose to use simple language and minimal design as to not alienate any users. The implementation of this design ended up being a simple interface, where clicking on an item changes it’s colour, with the item icons being the primary identifiers. One of the goals of the tool was to be as simple as possible and absolutely painless to use. If users had to log in to access their checklist, the tool would be going in a direction of over complication. I wanted to establish familiarity with my users, so I looked to the website for the game itself, finding a colour palette that users would recognize. This is reflective of the current colour scheme of Red on a Grey background. Rust is still in it’s alpha stages, meaning new updates come every few weeks, including adding new items to the game. To make adding any new items to the tool painless, I used AngularJS to dynamically display data from a JSON file, so that all I would have to do is update that file with any new items. In order to have the tool work without a user login, I decided to use HTML5 localstorage. This stores the user inputs on the users computer rather than a database, so that the same checklist would be available even if the user closed their browser. Upon completion, I used the games own subreddit to promote the tool and gain a user base and feedback. I quickly found that I was using an outdated version of the current item list. A testament to how necessary this tool was. It received enough attention to be currently featured in the subreddit sidebar. 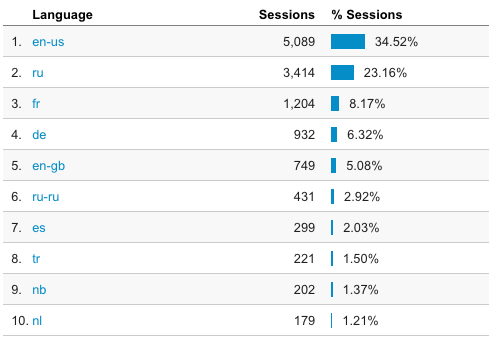 Currently there are over 14,000 monthly sessions using the tool, a significant portion of which are connecting from non-English speaking countries. I got to experience watching some players in game talking about the tool to each other. The experience was very rewarding, seeing buzz around something I made was exciting and motivating to continue creating great design.